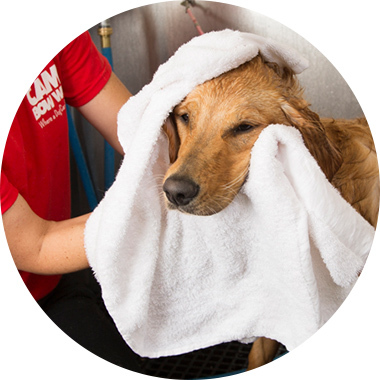 Contact us at (815) 385-7297 to learn more about our dog grooming services. Ideal for short-haired dogs such as Chihuahuas, Boxers, and Vizslas. Includes Bath and Towel Dry only. Prices vary based on size and coat type. Includes Quick Bath plus Blow Dry, Nail Trim, Ear Cleaning, and Brush-out. Prices vary based on size and coat type. Nail clip available by request. *Nail Dremel will incur an up-charge of $1. Full Bath with Trimming of the Face, Feet and Sanitary area. Nail Clip/Dremel available upon request. Includes Bath and Full Haircut. Prices vary based on size and coat type. Nail Clip/Dremel available by request. Let us reduce your dog's shedding with Furminator shampoo and conditioner! Add on to Full Bath or Grooming Services.